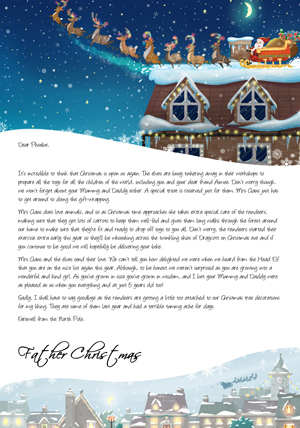 Please take a look at our letters below. The placeholders in yellow will be replaced with your personalisation options and you will be able to see a live preview when you order your letter, if you have any questions then please do let us know by clicking here. Today has been a great day here in the North Pole. The elves have had a much-needed day off from their duties creating toys to have fun and play together. They’ve been running around playing hide and seek in the forest surrounding our cottage all morning. While it looks like they’re having great fun, they’re very easy to find as they leave footprints in the snow! Silly elves! What is your favourite game to play with [Friends Name]? I do hope that the weather in [HomeTown] is much nicer than here. It’s got awfully cold recently, as it does every winter. The reindeers have been given extra blankets to keep warm, and they even had to drink some warm milk the other night to keep away the chill. Don’t worry, though, they’ll be toasty enough to deliver you a wonderful gift on Christmas eve. Are you still hoping for a [Present]? 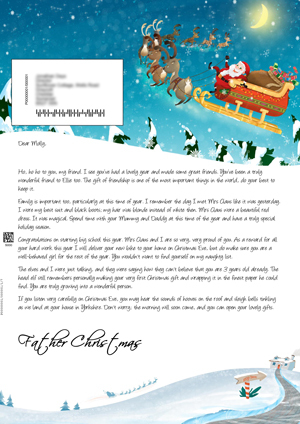 You’ll be delighted to know you’ve made our nice [Boy/Girl] list again this year. Your [Relative Name] also told us that you’ve been very clever and have achieved so much. Congratulations on your [Acheivement]. We’re all so very proud of you here at the North Pole. Do promise me you’ll continue to be good for the remainder of the year. [Santa Claus] here! I do hope I’ve caught you at a convenient time. It’s not often that you’re free from spending time with [Friends Name]. I do hope they’re well. Both of you are such wonderful children. It’s no surprise, then, that you’re on my NICE list yet again this year. Bravo! How is [Relative Name]? Do you know, when they were small they asked for a wonderful bike for Christmas? The elves were delighted to oblige. I think they must have spent more hours tinkering away in the workshop than I’ve ever seen them before or since. They do take such pride in their work. Especially for the very good children. This year you have proved yourself to be a wonderful friend, and a very clever [Boy/Girl] who is growing up fast. It’s hard to believe that just a short time ago you were a tiny bundle in a blanket and now you’re [Age Range] old. And such a high achieving child too. I was very impressed to see you [Acheivement]. Mrs Claus was so happy she ran to tell the elves quickly. As an award for your incredible year I would like to deliver something extra special to your home in [HomeTown] on Christmas Eve. I can’t guarantee it will be the [Present] you requested as the elves do have a lot of things to build, but I am sure it will be a most wonderful gift indeed. Alas, I must go to bed ready for another busy day in the workshop tomorrow. I am so glad that I finally got chance to sit down and write to you. The build up to Christmas is such a busy time of year that I can’t quite decide if I’m coming or going. Just this morning I had to help the elves unblock one of the conveyors on the great toy machine. There was quite a panic for a moment, but thankfully now the elves’ factory is filled with song and laughter again. I do hope that you are more relaxed in [HomeTown] and are enjoying this festive time of year. As for me, I’m planning a nice holiday as soon as Christmas time is over. 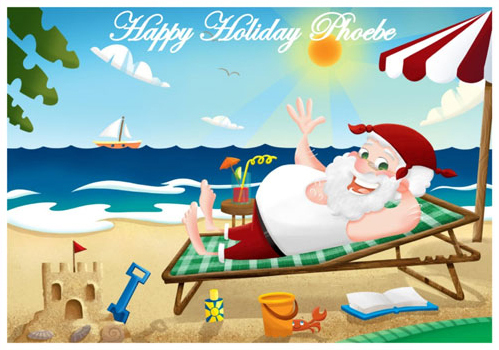 Mrs Claus and I are not quite sure where to visit yet, though we’re hoping for somewhere nice and sunny, so the reindeers can enjoy the beach. Have you spoken to [Friends Name] recently? I hope you are still getting on very well. But on to the reason of my writing. I’m very pleased to tell you that you have made my nice list this year. This is a wonderful thing, and I’m so very proud of you. You’re only [Age Range] old and yet you’ve already accomplished so much. 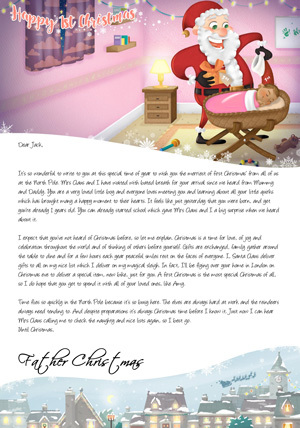 Mrs Claus was just telling me yesterday how you [Acheivement]. You are a very clever [Boy/Girl]. Your [Relative Name] are also clearly very proud of you too. Do give them my love, won’t you? As a reward for all the hard work and determination you’ve put in this year I would love to bring you an extra special gift. The elves tell me you would like a [Present] this year. I will send this request to the magic sack to see what it thinks. After all, it is the sack that chooses the gift that is just right for you. Are you having a jolly, holly Christmas time? I certainly am. I’m filled with Christmas cheer every year and love nothing more than to bring gifts to every boy and girl. Well, the ones on the nice list anyway. 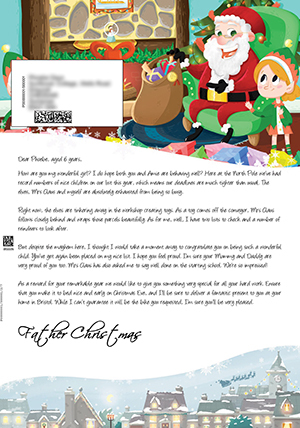 Christmas time is a time for loving and giving, so I do hope that you’ve been kind to your [Relative Name] and your friend [Friends Name], after all, they love you very much. Love is the greatest magic of all. Here at the North Pole we use it to power our sleigh. It is love that keeps our reindeers in the sky on Christmas Eve as they deliver the most wonderous presents. Believe in this most special magic and you will do well. I see from my list that you would like a [Present] brought to you this year. This is a most excellent thing. 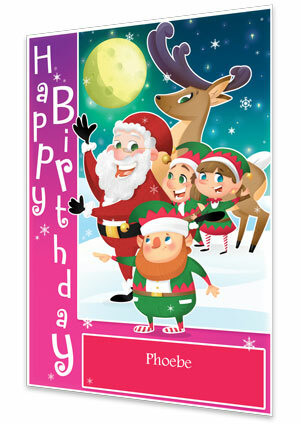 The elves had great fun testing these after production and were entertained for hours. Promise me that you will be a good [Boy/Girl] for the remainder of the year and I will do my very best to get one to you on time. No peeking as our sleigh comes flying over your house in [HomeTown], though. 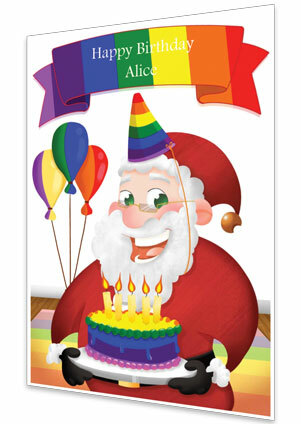 Before I go, I just wanted to say how very proud Mrs Claus and I are of you. You’ve grown into a wonderful, thoughtful child and every day you work hard to achieve your goals. We were delighted to find you [Acheivement]. At just [Age Range] old, too! We think you should give yourself a pat on the back. I do hope you’re having a lovely time there in [HomeTown]. Are you and [Friends Name] excited for Christmas? 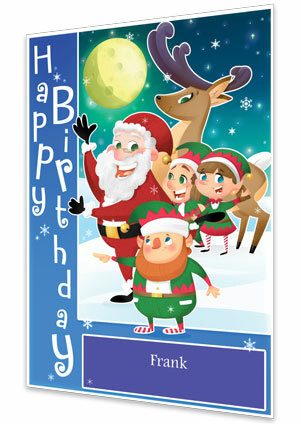 Here at the North Pole things are as busy as ever as we prepare for the big delivery. 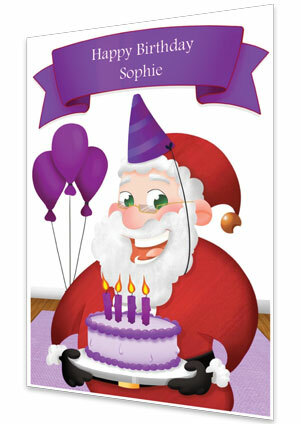 The elves are tinkering away creating new and exciting toys, and Mrs Claus is as busy as a bee in the kitchen. She loves to bake more than anything, and I love to eat her creations; especially her iced gingerbread. Mrs Claus and I have been speaking to the Head Elf and he’s been telling us all about the wonderful things you’ve been doing this year. Well done on your [Acheivement]. We’re all very proud of you here, we’re sure that your [Relative Name] is delighted at your successes too. You truly are a very remarkable [Boy/Girl]. I can’t believe you’re just [Age Range] old! As you’ve done so very well this year and have been an excellent [Boy/Girl] all year round, I am delighted to say you’ve made the nice list yet again. And good behaviour should always be rewarded. This year at Christmas Eve be sure to go to bed nice and early to get a good rest. We will do our best to bring you your requested [Present] with us as we deliver your town’s presents. Alas, I must go now as I have an awful lot of work to do before the big day. How are you my wonderful [Boy/Girl]? I do hope both you and [Friends Name] are behaving well? Here at the North Pole we’ve had record numbers of nice children on our list this year, which means our deadlines are much tighter than usual. The elves, Mrs Claus and myself are absolutely exhausted from being so busy. Right now, the elves are tinkering away in the workshop creating toys. As a toy comes off the conveyor, Mrs Claus follows closely behind and wraps those parcels beautifully. As for me, well, I have two lists to check and a number of reindeers to look after. But despite the mayhem here, I thought I would take a moment away to congratulate you on being such a wonderful child. You’ve yet again been placed on my nice list. I hope you feel proud. I’m sure your [Relative Name] are very proud of you too. 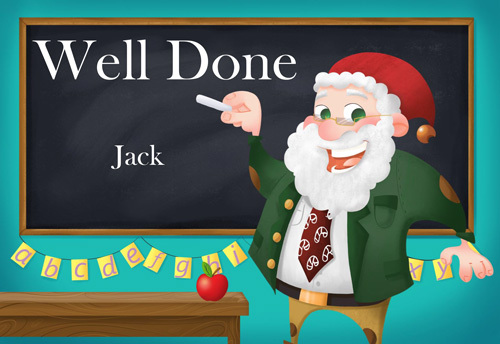 Mrs Claus has also asked me to say well done on the [Acheivement]. We’re so impressed! As a reward for your remarkable year we would like to give you something very special for all your hard work. Ensure that you make it to bed nice and early on Christmas Eve, and I’ll be sure to deliver a fantastic present to you at your home in [HomeTown]. While I can’t guarantee it will be the [Present] you requested, I’m sure you’ll be very pleased. Ho, ho ho! What a wonderful time of year it is. 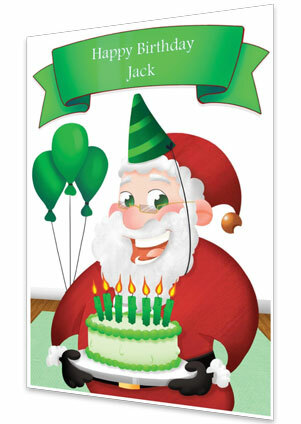 Santa here, wishing you a jolly, holly Christmas to you and your family. Do give your [Relative Name] my regards, won’t you? I’m pleased to see you’re on my nice list again this year. That’s every year so far, which is a very impressive feat. I can see that you’re growing into a wonderful [Boy/Girl] who brings joy to everyone they meet, especially [Friends Name]. Oh, I almost forgot. Congratulations on your [Acheivement]. We’re all thrilled in your successes. Me and Mrs Claus are ever so proud of you, [First name]! December 25th is fast approaching, which means that every elf here has been in the factory working hard to make toys for every child across the world. They always do such a wonderful job in creating just the right gift for the right child. I see you’ve asked for a [Present] to be delivered to your home in [HomeTown]. While I cannot promise you that this will be the final gift placed on the sleigh, I’m certain that whatever they choose will be the ideal choice for you. They’re experts at picking gifts for [Age Range] olds, after all. 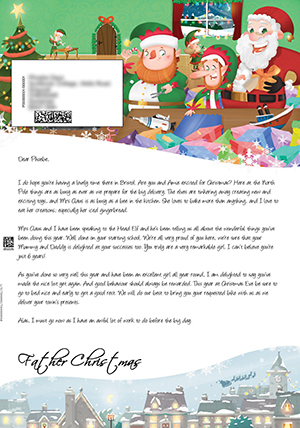 It’s so wonderful to write to you at this special time of year to wish you the merriest of first Christmas’ from all of us at the North Pole. 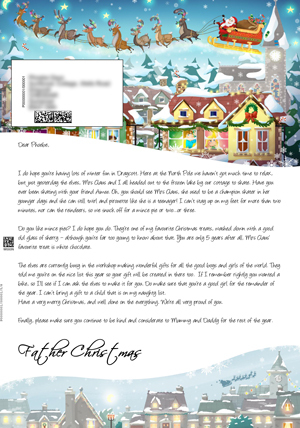 Mrs Claus and I have waited with bated breath for your arrival since we heard from [Relative Name]. You are a very loved little [Boy/Girl] and everyone loves meeting you and learning about all your little quirks which has brought many a happy moment to their hearts. It feels like just yesterday that you were born, and yet you’re already [Age Range] old. You can already [Acheivement] which gave Mrs Claus and I a big surprise when we heard about it. I expect that you’ve not heard of Christmas before, so let me explain. Christmas is a time for love, of joy and celebration throughout the world and of thinking of others before yourself. Gifts are exchanged, family gather around the table to dine and for a few hours each year peaceful smiles rest on the faces of everyone. I, Santa Claus deliver gifts to all on my nice list which I deliver on my magical sleigh. In fact, I’ll be flying over your home in [HomeTown] on Christmas eve to deliver a special item, [Present], just for you. A first Christmas is the most special Christmas of all, so I do hope that you get to spend it with all of your loved ones, like [Friends Name]. Time flies so quickly in the North Pole because it’s so busy here. The elves are always hard at work and the reindeers always need tending to. And despite preparations it’s always Christmas time before I know it. 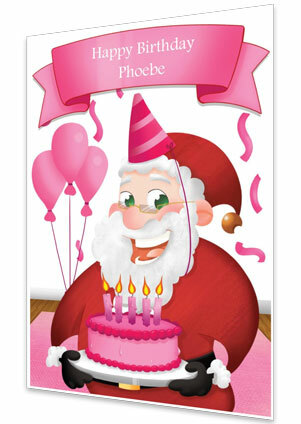 Just now I can hear Mrs Claus calling me to check the naughty and nice lists again, so I best go. I do hope you’re having lots of winter fun in [HomeTown]. Here at the North Pole we haven’t got much time to relax, but just yesterday the elves, Mrs Claus and I all headed out to the frozen lake by our cottage to skate. Have you ever been skating with your friend [Friends Name]? Oh, you should see Mrs Claus, she used to be a champion skater in her younger days and she can still twirl and pirouette like she is a teenager! I can’t stay up on my feet for more than two minutes, nor can the reindeers, so we snuck off for a mince pie or two…or three. Do you like mince pies? I do hope you do. They’re one of my favourite Christmas treats, washed down with a good old glass of sherry – although you’re far too young to know about that. You are only [Age Range] old after all. Mrs Claus’ favourite treat is white chocolate. The elves are currently busy in the workshop making wonderful gifts for all the good boys and girls of the world. They told me you’re on the nice list this year so your gift will be created in there too. If I remember rightly you wanted a [Present], so I’ll see if I can ask the elves to make it for you. Do make sure that you’re a good [Boy/Girl] for the remainder of the year. I can’t bring a gift to a child that is on my naughty list. Have a very merry Christmas, and well done on [Acheivement]. We’re all very proud of you. Finally, please make sure you continue to be kind and considerate to [Relative Name] for the rest of the year. It’s incredible to think that Christmas is upon us again. The elves are busy tinkering away in their workshops to prepare all the toys for all the children of the world, including you and your dear friend [Friends Name]. Don’t worry though, we won’t forget about your [Relative Name] either. A special treat is reserved just for them. Mrs Claus just has to get around to doing the gift-wrapping. Mrs Claus does love animals, and so as Christmas time approaches she takes extra special care of the reindeers, making sure that they get lots of carrots to keep them well-fed and gives them long walks through the forest around our home to make sure that they’re fit and ready to drop off toys to you all. Don’t worry, the reindeers started their exercise extra early this year so they’ll be whooshing across the twinkling skies of [HomeTown] on Christmas eve and if you continue to be good we will hopefully be delivering your [Present]. 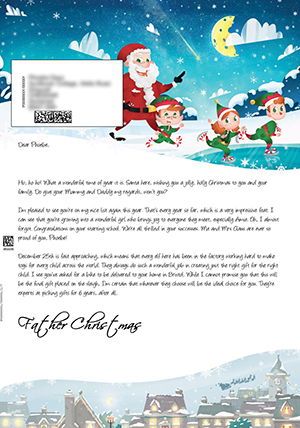 Mrs Claus and the elves send their love. We can’t tell you how delighted we were when we heard from the Head Elf that you are on the nice list again this year. Although, to be honest we weren’t surprised as you are growing into a wonderful and kind [Boy/Girl]. As you’ve grown in size you’ve grown in wisdom, and I bet your [Relative Name] were as pleased as us when you [Acheivement] and at just [Age Range] old too! Sadly, I shall have to say goodbye as the reindeers are getting a little too attached to our Christmas tree decorations for my liking. They ate some of them last year and had a terrible tummy ache for days. Farewell from the North Pole. Ho, ho ho to you, my friend. I see you’ve had a lovely year and made some great friends. You’ve been a truly wonderful friend to [Friends Name] too. The gift of friendship is one of the most important things in the world, do your best to keep it. Family is important too, particularly at this time of year. I remember the day I met Mrs Claus like it was yesterday. I wore my best suit and black boots; my hair was blonde instead of white then. Mrs Claus wore a beautiful red dress. It was magical. 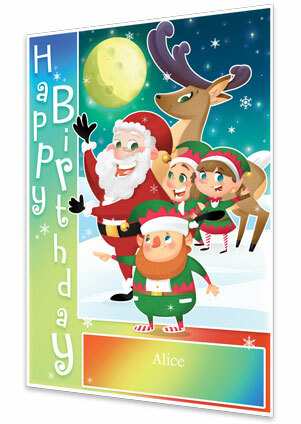 Spend time with your [Relative Name] at this time of the year and have a truly special holiday season. Congratulations on [Acheivement] this year. Mrs Claus and I are so very, very proud of you. 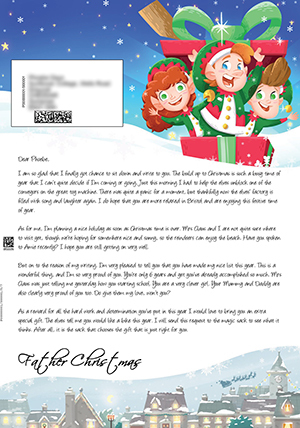 As a reward for all your hard work this year I will deliver your [Present] to your home on Christmas Eve, but do make sure you are a well-behaved [Boy/Girl] for the rest of the year. You wouldn’t want to find yourself on my naughty list. 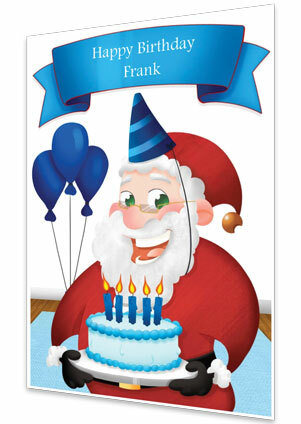 The elves and I were just talking, and they were saying how they can’t believe that you are [Age Range] old already. The head elf still remembers personally making your very first Christmas gift and wrapping it in the finest paper he could find. You are truly growing into a wonderful person. If you listen very carefully on Christmas Eve, you may hear the sounds of hooves on the roof and sleigh bells tinkling as we land at your house in [HomeTown]. Don’t worry; the morning will soon come, and you can open your lovely gifts. My, what a busy few weeks it has been preparing everything for Christmas. 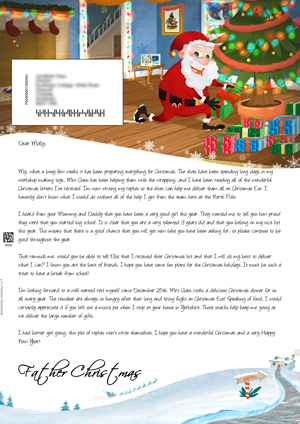 The elves have been spending long days in my workshop making toys, Mrs Claus has been helping them with the wrapping, and I have been reading all of the wonderful Christmas letters I’ve received. 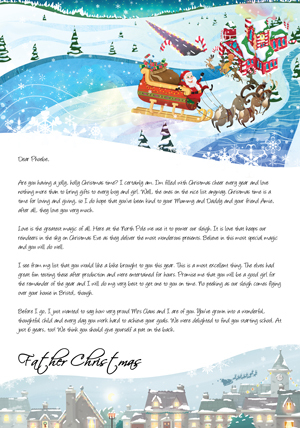 I’m now writing my replies so the elves can help me deliver them all on Christmas Eve. I honestly don’t know what I would do without all of the help I get from the team here at the North Pole. I heard from your [Relative Name] that you have been a very good [Boy/Girl] this year. They wanted me to tell you how proud they were that you [Acheivement]. It is clear that you are a very talented [Age Range] old and that you belong on my nice list this year. This means that there is a good chance that you will get [Present] you have been asking for, so please continue to be good throughout the year. That reminds me, would you be able to tell [Friends Name] that I received their Christmas list and that I will do my best to deliver what I can? I know you are the best of friends. I hope you have some fun plans for the Christmas holidays. It must be such a treat to have a break from school! I’m looking forward to a well-earned rest myself come December 25th. Mrs Claus cooks a delicious Christmas dinner for us all every year. The reindeer are always so hungry after their long and tiring flight on Christmas Eve! Speaking of food, I would certainly appreciate it if you left out a mince pie when I stop at your house in [HomeTown]. Those snacks help keep me going as we deliver the large number of gifts. I had better get going; this pile of replies won’t write themselves. I hope you have a wonderful Christmas and a very Happy New Year! 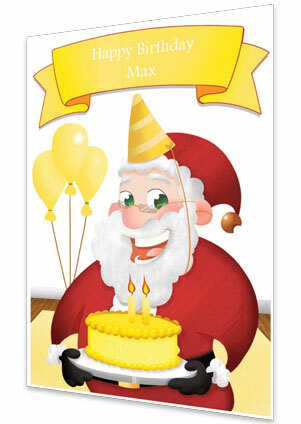 [Santa Claus] here just wishing you a very merry Christmas. I do love this time of year, and it’s fantastic that so many other boys and girls enjoy it too. The reindeers are raring to go, and can’t wait to deliver your presents to your home in [HomeTown] this Christmas. The [Present] you requested is already nestled amongst the other presents on the sleigh, ready to be delivered to you, so please continue to be a good [Boy/Girl] for the rest of the year. The presents that your dear friend [Friends Name] requested are also ready too. You both have behaved fantastically this year, and have achieved many things. I’m especially impressed that you [Acheivement], and at just [Age Range] old too! I would be very grateful if you could leave me and the reindeers a lovely snack to munch on when we arrive at your house. It’s very tiring delivering millions of presents all over the world and we work up huge appetites. The reindeer’s favourite food are juicy carrots, but I am partial to a mince pie. Would you mind asking your [Relative Name] to put some out for us? 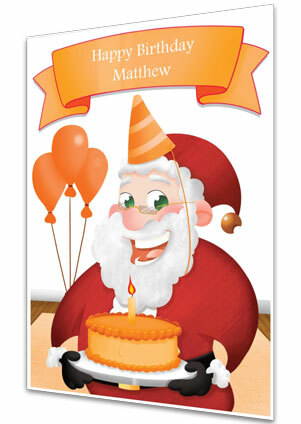 It’s best that I go now, [First name], as I still have lots of work to do before the big day and Mrs Claus is cooking a lovely roast dinner, it smells amazing! We’re frantically trying to get everything ready for your 1st Christmas; there are presents everywhere and merry elves singing merry songs. I just saw our head elf who tells me that you are now [Age Range] old. I thought that the head elf must have had something wrong with his memory; it seems like just yesterday you were born! I can’t wait to learn more about you over the years and never forget that I am looking out for you will you? 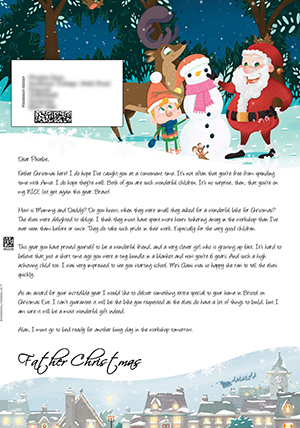 Head elf tells me that your [Relative Name] said you’d been a very good [Boy/Girl] this year and confirmed that you would be receiving your [Present] this Christmas! When I heard the good news I ran to tell all the reindeer that we would definitely be stopping at your home in [HomeTown] this Christmas. Donner and Blitzen were so excited by the news they flew around the factory and got themselves all tangled up in Christmas lights on the ceiling! The elves had to free them by sitting on each other’s shoulders, forming a tower of elves! Mrs Claus and I were laughing jollily. I nearly forgot to mention! 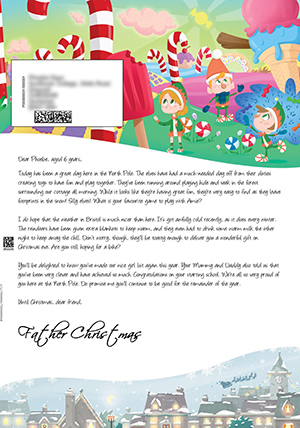 We received a letter from [Friends Name] too. I am excited to say that they are also on the nice list this year too, just like you. Tomorrow I have to get up bright and early and help Mrs Claus who is fixing the sleigh, then I have to bake a whole lot of biscuits to feed the elves – it’s been a few days since they’ve had any biscuits and they get a bit silly without them! 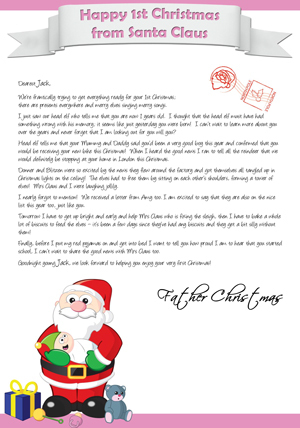 Finally, before I put my red pyjamas on and get into bed I want to tell you how proud I am to hear that you [Acheivement], I can’t wait to share the good news with Mrs Claus too. Goodnight young [First name], we look forward to helping you enjoy your very first Christmas! Summertime is finally here, and I am so happy to say that I have managed to get some time to go and see the pyramids. 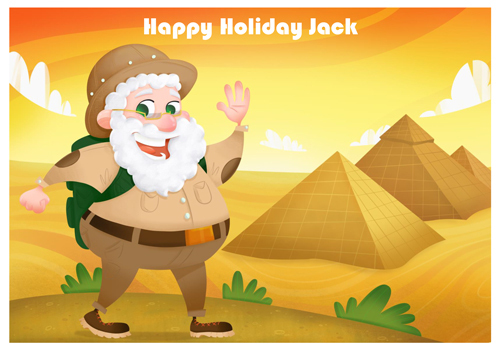 The head elf has just headed off on a camel trek along with the reindeers. As you can imagine I do prefer the snow of the North Pole, however it is lovely to get some rest and relaxation before we start to get busy later in the year. I absolutely love spending time walking and enjoying the warm sunshine whilst on holiday. I should mention that the reindeers and elves are also here with me. They have been busy this morning building sandcastles. They are so funny! I really hope that you have a wonderful summer that is filled with fun, laughter and enjoyment. 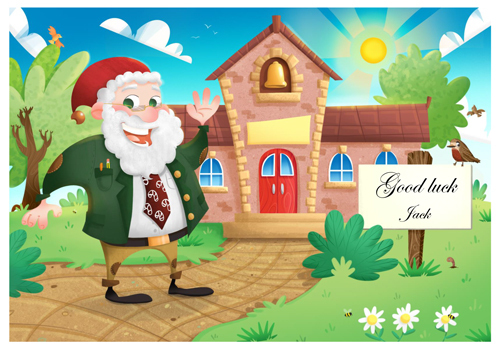 Remember to send me a postcard from your holiday letting me know all the exciting things you are up to, plus I will also keep an eye out for your letter later in the year letting me know how good you have been. Summertime is finally here, and I am so happy to say that I have managed to find my giant inflatable unicorn from our storage cupboard at the North Pole. I think the head elf wanted to keep it for himself, but I insisted that I needed it for the hotel swimming pool. As you can imagine I do prefer the snow of the North Pole, however it is lovely to get some rest and relaxation before we start to get busy later in the year. I absolutely love spending time at the swimming pool, reading books and enjoying the warm sunshine whilst on holiday. I should mention that the reindeers and elves are also here with me. They have been busy this morning building sandcastles down on the beach. They are so funny! 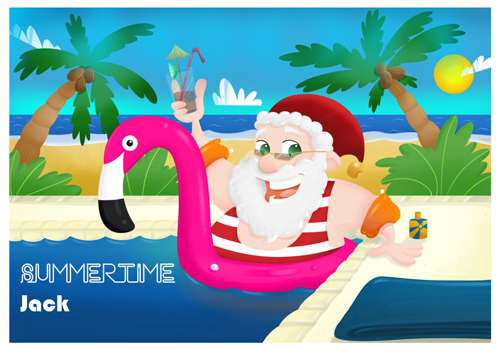 Summertime is finally here, and I am so happy to say that I have managed to find my giant inflatable flamingo from our storage cupboard at the North Pole. I think the head elf wanted to keep it for himself, but I insisted that I needed it for the hotel swimming pool. As you can imagine I do prefer the snow of the North Pole, however it is lovely to get some rest and relaxation before we start to get busy later in the year. I have heard that you have already been to [HomeTown], how exciting. I really hope that you had a wonderful time that was filled with fun, laughter and enjoyment. Remember to send me a postcard letting me know all the exciting things you have been up to, plus I will also keep an eye out for your letter later in the year letting me know how good you have been. I have heard that you are going to [HomeTown] soon, how exciting. I really hope that you have a wonderful time that is filled with fun, laughter and enjoyment. I have heard some great news, I have been told by [Relative Name] that you have done ever so well starting [HomeTown] in [Acheivement]. I am so pleased that you have been doing so well, remember this is a very important time of your life when you need to listen to your teachers and try your best, that is all we ask of you. The best thing is that you also get to see your friends every day, especially [Friends Name]. Say hello to them for me. Christmas is not very far away, so make sure that you continue to be good and then I know that I will see your name sparkling high up on my Nice List. I look forward to hearing from you very soon with your letter, letting me know all the lovely things you have been up to and what is on your wish list. Can you believe it is nearly time to start school for the very first time? Did you know that there are millions of children around the world that will also be starting their first day at school very soon, how exciting! I remember my very first day at school in the North Pole being so much fun where I got to meet lots of new friends and also meet my new teacher. I heard from your [Relative Name] and they told me that you are going to be starting school at [HomeTown] in your new class [Acheivement]. I know you will be fantastic starting school and I hope you have a brilliant first day. I hear that [Friends Name] will also be heading to school soon too, make sure you say hi to them from me. 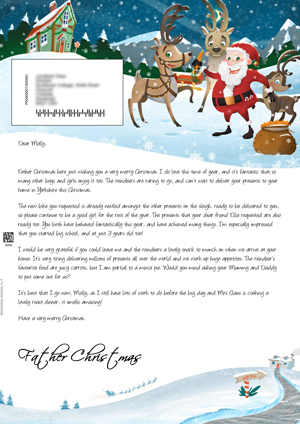 I better go as the reindeers want their dinner now, good luck for your very first day and remember you can always pop me a letter in the post. Can you believe that the school holidays are nearly over, I can’t believe how fast the holiday season goes, I hope you have had a lovely summer with your friends and family. It will soon be time for me to get my lovely red suit out of the cupboard and prepare for the winter, and you know what that means, presents! My favourite time of year. I heard from your [Relative Name] and they told me that you are going to [HomeTown] and heading into [Acheivement], how exciting. I wish you good luck for starting the new year and I know that you will make your teachers proud. I know you will do well settling back in and just imagine, you will soon be able to see all your friends again, especially [Friends Name]. Make sure you find out all the lovely things that they have been up too. I better go as the reindeers want their dinner now. Remember you can always pop a letter or a postcard in the post to keep me up to date. My oh my, I am not used to this hot weather, I prefer the cold snowy hills of the North Pole, however it is great to get some rest and relaxation on holiday before my busy season later this year. The reindeers and I have been spending most of our time at the beach building sandcastles and out surfing in the ocean. 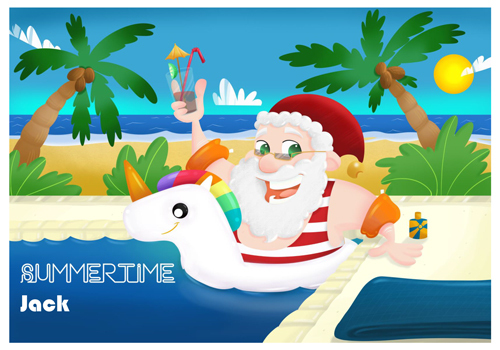 When we are on holiday we love spending time in the water and give our sleigh a well-earned rest. I wanted to write a quick postcard to you to say hello and to let you know that I look forward to receiving your letter later this year. I really hope that you had a wonderful summer and make sure you have lots of fun with your friends and family. I love hearing from you, so remember you can always write back to me with a postcard. I hear that you have been to [HomeTown] on holiday recently. I really hope that you had a wonderful time, enjoyed yourself and had lots of fun with your friends and family. I hear that you are off on holiday to [HomeTown] soon. I really hope that you have a wonderful time and have lots of fun and enjoy spending time with your friends and family. Remember to send me a postcard from your holiday letting me know all the exciting things you are up to.